A quick update on the Merito service that is intended to help gamers not yet into crypto currencies to easily make some extra cash from their gaming computers’ hardware. We’ve been keeping an eye on the service and everything seems to be progressing pretty well with new updates and fixes getting released and more users joining. 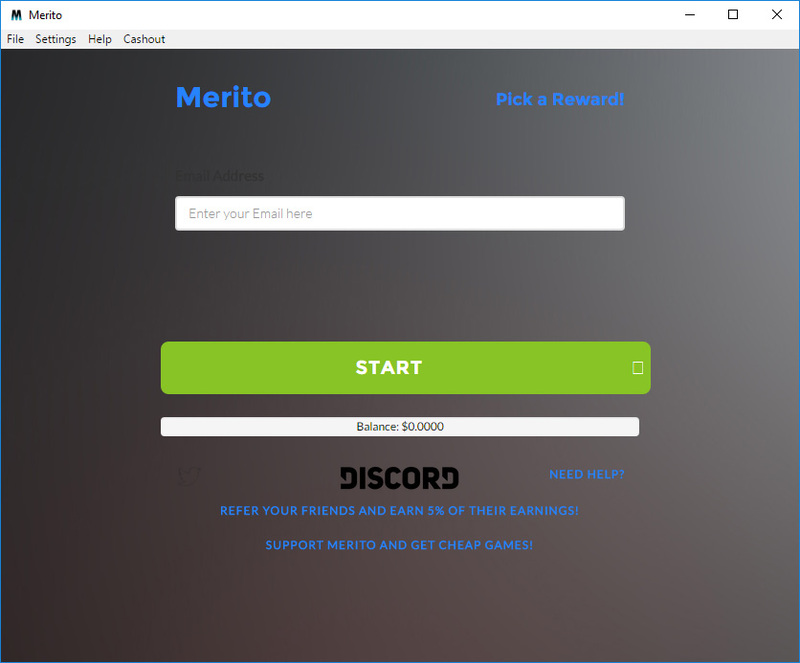 Since Merito is targeted at gamers it allows you to use your computer hardware and mine in order to get a new game as a reward, vouchers for game purchases from G2A or get your earnings paid with PayPal. We have tried cashing out our earnings while testing to PayPal and in a couple of hours after requesting the payment they were transferred in our account. This makes it easy not to care about what crypto you are mining or what is the exchange rate or how to convert them to cash if you are a gamer. Of course this is intended for gamers, not for the regular crypto miners that actually do care about all these things. Applications and services trying to get people from outside crypto currencies to start mining are nothing new for example Minergate. The problem with these however is that they are targeting regular users that may not have the right hardware for profitable crypto mining and more specifically a good GPU. 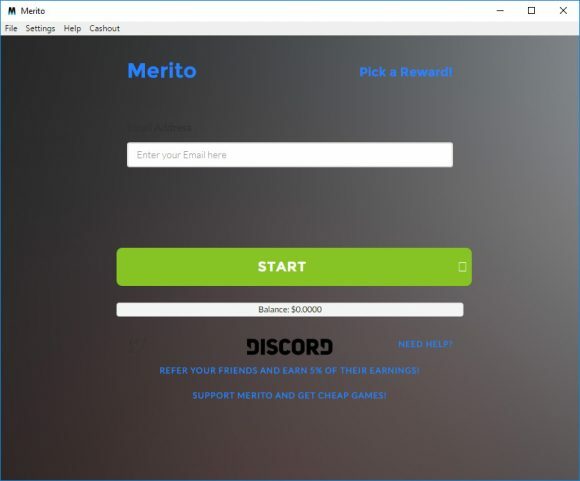 Here comes a new contender called Merito in the form of an easy application targeted at gamers and giving them the opportunity to utilize their higher-eng gaming PCs for mining while they are not in use. All you need to do to get started is make a quick registration and download and run the provided application, no hard to do configurations or setting things up, just type your email address (the one you registered with) in the app and click the Start button. The GUI is going to show you the earnings you have accumulated so far and an estimate on what you may earn. 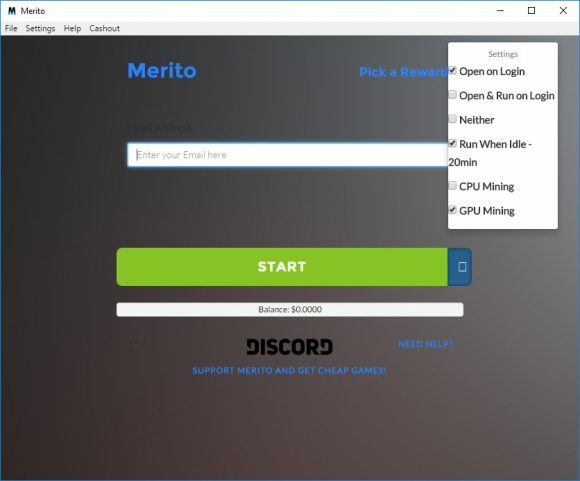 By default the Merito app should start with Windows, but it will start mining only after the computer has been idle for at least 20 minutes and will use only the GPU for mining. You can also add CPU mining and make the application run with the start of the operating system or run it only manually. There is also the option to schedule it to run only in a specific time frame such as during the night. Another interesting feature is the ability to enable Charity mining and set a percentage or support your favorite Twitch steamer with a percentage you decide from what you have earned mining. 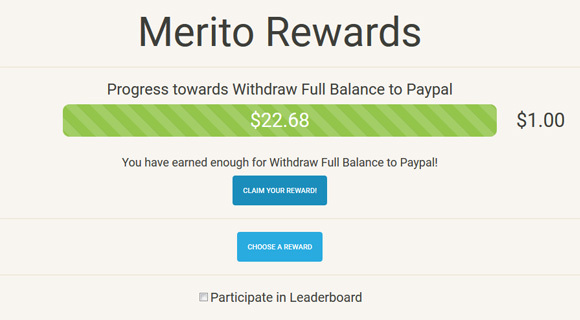 The main idea of the Merito application is to make it easy for gamers to earn something back from the gaming hardware they have purchased and either get paid through PayPal or get games with what they earned. As a backend and for the actual mining the app uses Monero (XMR) miner for the CPU as well as ZCash (ZEC) miner for the GPU with the mining applications included with the graphical user interface. So far the application is being used by about 600 people which is not a bad start at all and with a lot of gamers out there that are not into crypto mining the potential for growth is quite big.